Full disclosure: I’m a Beautycounter consultant — a company whose mission is to get safer products into the hands of everyone. Shop here. 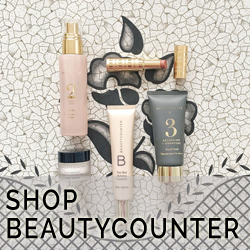 Beautycounter has banned over 1,500 ingredients from their products (aka The Never List™). Email me at laura@alushlife.ca to join the mission! As we break down these thought patterns, another issue arises though: Are our beauty and personal care products healthy for us? Or are they causing us harm? There’s nothing I want more than to look at any woman and know for a fact that every product she puts on her body isn’t contributing to hormonal and reproductive issues, cancer, allergies or chronic illness. I want to feel secure that in those 26 seconds it takes her skin to absorb the chemicals (Don’t be afraid of this word, even water is a chemical — H2O!) in her personal care products that those ingredients aren’t doing more harm than good. The last time the U.S. passed a law protecting citizens from ingredients in personal care products was 1938. In case you’re counting, that is 80 years ago and only 30 ingredients were banned. Things in the personal care industry are a bit different now as I’m pretty sure gel polish, CC creams or highlighters didn’t exist then. Today, over 80,000 chemicals are used in products and companies are not mandated to provide safety data. Statistics say the average woman uses around 500 chemicals on her skin every day. Do you know what each ingredient on your product’s label is, what it’s used for and its risk level? The answer is probably, no. How could you when you expect what’s on the shelves to be regulated and safe to use? It’s just soap/shampoo/conditioner/moisturizer, right? Wrong. Your skin is your largest organ and you need to know how to protect it. Other countries put the safety of their personal care products to a higher standard. The E.U. has banned 1,400 ingredients while Canada has banned or partially-restricted 600 — in the U.S. only 30 ingredients have bans or restrictions. But, there are plans to fix the laws. In the U.S., Senators Dianne Feinstein (D-CA) and Susan Collins (R-ME) have co-written a bipartisan bill called the Personal Care Products Safety Act, which would give the Food and Drug Administration the ability to regulate and add more transparency to the industry. It is hoped this bill will be voted on later this year (Send a letter to your senator!). As of right now, the FDA doesn’t have to approve a product before it’s for sale, nor do they have much power over recalls. Plus, Hawaii just banned oxybenzone and octinoxate from sunscreens due to the belief these harmful chemicals cause damage to coral reefs. And that’s just the environmental effect — oxybenzone is also known as an allergen and possible hormone disruptor. Let’s hope other states and countries follow Hawaii’s lead. But, before you run out and buy everything that says it’s natural, organic, earth-friendly, chemical-free (Remember water is a chemical too! ), green, pure, botanical etc. note these terms have no legal backing either. These are just marketing labels used to attract your attention and hard earned dollars. My best example — You wouldn’t rub organically grown, natural poison ivy on your skin, would you? This tactic is known as green washing and it’s very commonplace. The best way to beat green washing and know exactly what you’re putting on your skin is to label read vigourously, ask the company questions and do your own investigative work. Is that “natural extract” the last on the ingredient list (Ingredients are listed by the amount found in the product)? Is it certified by a recognized and trusted organization like the USDA or B Corporation? Does the company test it’s own ingredients alone and when in combination in the product? Find the answers and protect yourself. Trust me, this doesn’t take the fun out of beauty. It puts the power of beauty back in your hands. So what ingredients are definite no-nos? Parabens – Avoid any ingredient ending in –paraben. Parabens are used as preservatives in shampoos, cleansers, lotions and foundation. They are known hormone disruptors. Fragrance/Parfum – I know, this one is tough to give up! But, fragrance is actually a catchall term that could equal any combination of 3,000 ingredients. Under law it’s a trade secret, so even if you asked a company what was in their fragrance, they wouldn’t have to tell you. Retinyl palmitate and Retinol (Vitamin A) – As well-known skin care ingredients, you would expect Retinyl palmitate and Retinol to be safe. Unfortunately, research shows that long-term exposure can lead to the speedier growth of skin tumors. Formaldehyde – Found on labels as MANY different ingredients, formaldehyde is a known carcinogen but is still found in shampoos and body washes. Check for quaternium-15, DMDM hydantoin, imidazolidinyl urea, diazolidinyl urea, sodium hydroxymethylglycinate, 2-bromo-2-nitropropane-1,3 diol (Bronopol) on ingredient lists. Sodium Lauryl Sulfate and Sodium Laureth Sulfate (SLS and SLES) – You are already probably aware that these two ingredients are on many beauty products labels as being SLS/SLES-free. They’re the ingredients that create the lather in shampoos or the bubbles in body washes, but they also can cause irritation and allergies. Don’t forget to check your laundry detergent, fabric softeners, toothpaste, mouthwash, hand soaps and bug sprays too. There are safer alternatives out there!